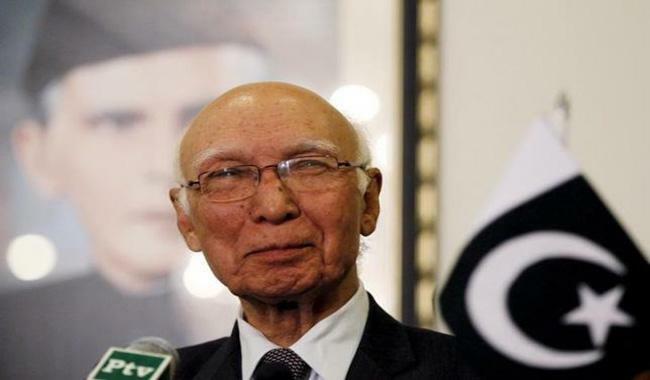 ISLAMABAD: Adviser to Prime Minister on Foreign Affairs, Sartaj Aziz has strongly criticized Indian PM Narendra Modi over his remarks on Balochistan in his Independence Day speech. He further said that Modi is trying to divert world’s attention from Kashmir where over 70 innocents have been martyred and 6,000 injured over the past five weeks. There is constant curfew and complete media blackout for the past 37 days. “These events have nothing to do with terrorism. It is an indigenous movement for self-determination, a right promised to the Kashmiris by the UN Security Council”, he remarked.